Dive into the World of Gambling! In certain situations in games like Blackjack, the casino VIG (house advantage) can be attacked and turned into your favor. In Games like Craps and Baccarat, you fight a casino advantage of less than 2% on the prime betting options. But with Video Poker you will go up against an advantage which could be as low as 0% or as high as 25%, everything depends on you only. One hundred people make up their minds to play Video poker. Now, they all play at the same machines. They deposit $100 over several days or weeks. The total is $10,000. Out of the 100 players, 50 lose all their money. These players have won large and small hands, but they decided to continue betting till they lose all the money they had. They could have earned and lost this money over a few days or over several weeks. Now out of this same group, 40 walk away with $50. Keep in mind that they left after losing half of what they invested. Out of the 100 people, 4 people experience reasonable success. E.g. : they cash out $200. They doubled their stakes and that is good for them. Now that leaves us with only 6 people. 5 out of these 6 have done well. Each gets $500. That's good news. They started with $100 and made winnings of $400. Time to have some fun! Now that we have covered 99 out of the 100 people who played, it leaves us with one individual. You would be wondering how this person fared. Well, this individual earned $4000. Like everybody else, this individual started with $100 playing the same machine. Perhaps, this person was luckier and smarter than the rest. Like in most games we play, there are tons of losers and only a handful of winners. You must be thinking about the machine you play at. $10,000 was put into the machines and $9500 was given back to the players. This means the machines gave back 95% of each dollar put into it. The machines did what it was programmed to do precisely - paid out a cetrain percentage. A few people lost hands as they made mistakes, while others lost hands because they were ignorant or because they misplayed. The big winners were the ones who made intelligent decisions and choices on each hand they played. The machine doesn't care about this. It can't. The machine was programmed to give back 95 cents for each dollar put into it. It would have done whatever it was programmed to do. The machine doesn't tire out or make mistakes as it is a machine! You can win over the machines for a short term or for several years, but you cannot win against it forever. Sooner or later the machine will catch up and you will end up losing more money than winning. But there is another option - to play free video poker. Essentially, Video Poker is quite the same as other games. However, the casino is in a favorable position. But be rest assured that if you are skillful, intelligent and have loads of luck on your side, you can do a lot to overcome the odds. In the end it's all up to you. 2013: The Year of Ivey? 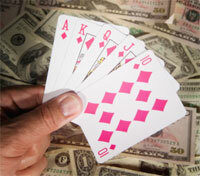 If you learn how to play the hands right, video poker will be your favorite online game among other attractions. Wondering how to play video strip poker? Better figure out how to play slots online first and then practice with others. Playing video poker is a good choice comparing to slots. The overall return is much better in most cases. Knowing the video poker and other slot games terms is essential to understand what the rules and strategies. If you want to play video poker, you should keep in mind many things to make the most of your money. All the information provided at the website is for entertainment purposes only. Your and the author's opinins can not coincide. Also note that the website materials are not for use in the areas where the gaming promotion is forbidden by law. So before using the site services make sure of the online gambling/poker legality in your area. 2019 © All-VideoPoker.com. All Rights Reserved.